This competitive defense and rebounding drill is coached by Mississippi State Coach Vic Schaefer. At the time of this post, Mississippi State will has reached the Sweet 16 as a #1 seed in their region. They ended UConn’s record consecutive win streak at 111 in the 201 Final Four. There is sound with the video, so please make sure that your sound is on. The video is hosted on You Tube, so you will need to be on a network that allows you to access that site. You will want to modify the drill to defend actions that your opponents run. I like the fact that the defenders are moving to defend more in a game-like way than many rebounding drills I have seen. The video is 5 minutes and 38 seconds long and shows this drill for the entire clip. This video is with Emmanuel College Head Men’s Coach TJ Rosene, who is also a Director for PGC Basketball. 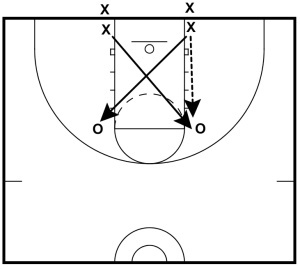 The purpose of this drill is to give you another competitive shooting drill to add to your Drill Book. Like a game, players experience not only relying on themselves to make shots to win, but also relying on their teammate. 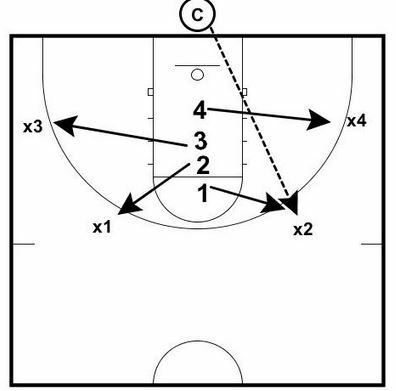 You need 2 pairs of players to run the drill. The drill gets it name from the way it is played. If the first player makes the shot, the second player must make his or her shot to validate the first shot and earn a point. If the first player misses the shot, then the other team’s first shooter will shoot. Tweak the rules and types of shots and spots/sides of the floor to fit your needs and to add variety. Please make sure that your sound is on and click on the video to play. Click the play arrow to view the video. 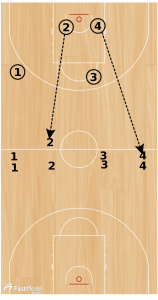 This competitive scoring drill came from the FastModel Sports Basketball Plays and Drills Library. This drill was contributed by Coach Fabian McKenzie, Cape Breton University Women’s Basketball. He has been a head coach at the university level for 16 years, and has been involved as a coach at this level for 20 years. He has been involved with the Canadian Women’s National team program for the past 8 years. If the setup for the drill does not fit your needs, tweak the version you run so that it does. When coach blows whistle they head to basket and take a choice of shots. They get one shot attempt. If they make it they collect the points for their team. If they miss they must rebound and get ball to next teammate. Our only rule is that your next pass to a teammate must be received on the same side of half court. In this example, 2’s pass is good. 4’s is illegal and they must go back to opposite side of half before attempting shot at other end. You could also deduct a point for the infraction. These 2 rebounding drills are from Matt Monroe’s former Hoops Roundtable site. Matt is the Head Boys Coach at Saint Ignatius in Chicago. Use these drills as ideas for improving the drills you use to teach and reinforce your defensive concepts and principles.